Herb Robert is a species of Geranium. Many people think geraniums are the red flowers that the Swiss grow in window boxes. No, these are Pelargoniums and there are lots of different species and varieties apart from the bright Red ones but they are Pelargoniums. Below is Herb Robert. Normally pink but you occasionally get white specimens. There are also lots of different Geraniums which people grow in their gardens. I quite like them and have several types in my garden. 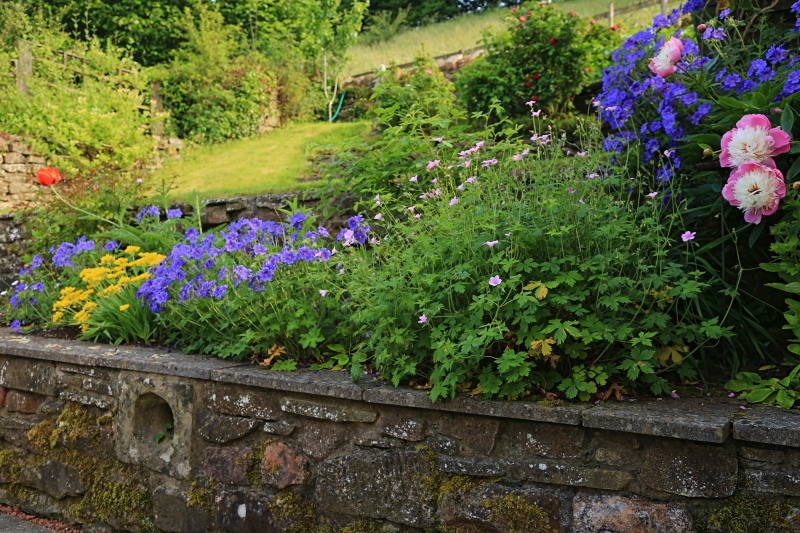 (The blue ones and the little pink ones) There are also lots of different species of geranium which grow wild in the UK. They are mostly called Cranesbills and they vary in size and colour from Meadow Cranesbill which has large blue flowers, through to Small flowered Cranesbill which has quite small light pink flowers. There are two species which do not have the name Cranesbill one is Herb Robert and the other is Little Robin. However you can see from its scientific name that it is a Geranium. 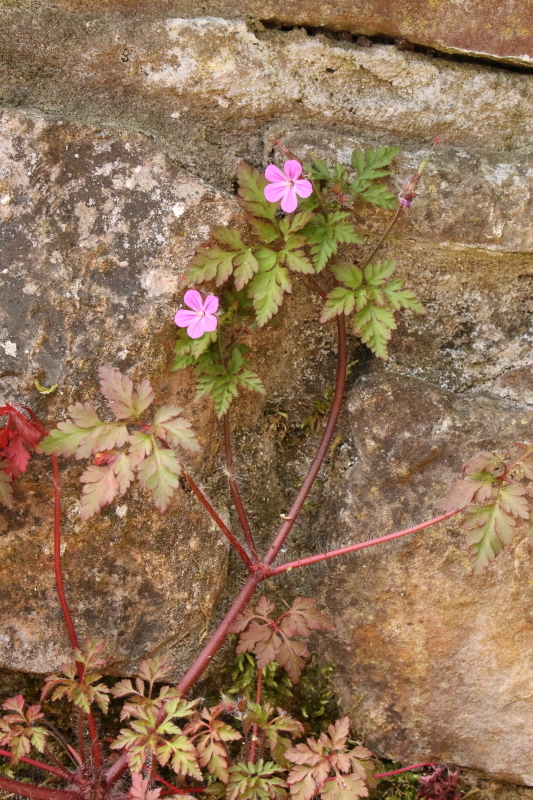 Herb Robert will grow in a variety of places and it is quite shade tolerant so is a true woodland plant. It is not too happy in really acidic situations. I have it in my garden as a weed which I tolerate and quite like. It seems to be quite happy growing out of crevices in the walls among other places. Quite often when it is growing in more sunny places the leaves develop a red colour as can be seen in the photo below. Quite a few woodland plants show this type of behaviour. I believe they are developing a secondary pigment which helps prevent what is known as photo oxidation of the main pigments of Chlorophyll a and Chlorophyll b which whilst their job is to absorb light and use the energy to effect photosynthesis they can get damaged by too much light and their delicate chemical structure can be damaged. Thus the need for secondary pigments to protect them. When the flower is over a seed capsule develops which has a long pointed bit and a bulbous base. The seeds are contained in the base. Many cranesbills spread by flinging their seeds out with the help of the flexible outer wall of the tips of their carpels. 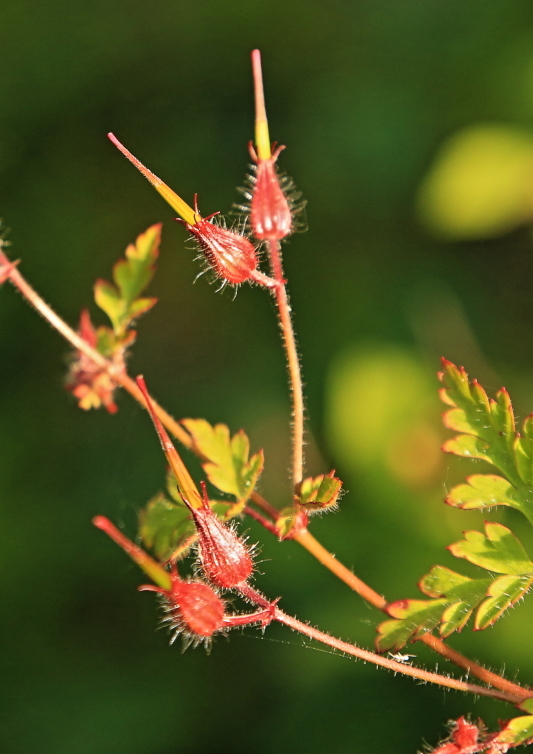 Herb Robert on the other hand relies on two white bristles that are deeply lobed at the tip and which reveal themselves only when the tip breaks away from the fruit. These fibres easily attach to passing people and animals, and can thus travel long distances. The species can also be met as a casual alien outside its clearly established habitat. If they can’t find a suitable ride the seeds attach to the plant’s own leaves and stem until the rotten carpel’s wall breaks and the seed falls to the plant’s roots. It is widely distributed throughout Great Britain and is very common. It flowers for a long period, almost throughout the year but certainly from March to October. This one being visited on 2nd May by an Orange Tip Butterfly. Freshly picked leaves have a peculiar odor resembling burning tires when crushed, and if they are rubbed on the body the smell is said to repel mosquitoes, it also makes you smell bad! It is also said that it is a source or Germanium an element which we need in small quantities and that it helps prevent cancer. Now don’t go eating stacks of it on my account but if you want to find out more then click on this web site and they can take the blame/credit for any consequences. There is a Face Book group group called ‎Wild Flowers of Britain and Ireland.and it has several thousand members, it is worth a look if you like wild flowers, even worth joining. There are lots of questions about ‘what is this flower in the photo below’ but also some very good photography. Anyway recently (Jan 2018) a lady called Lana Huntley put this picture on there. I along with others were quite impressed so I asked if she would allow me to show her creation on this page and she said yes. I do not know if she has a web site or sells these commercially but if she does not then I think she could. I think this has elements of Miro, Dali and Gaudi. I would like to see other stuff by this lady.